Quivers fashioned from bamboo tubes were used by hunters throughout Borneo to hold blowpipe darts for the hunting of animals. This lidded tube was an essential item used to protect the hunter from the darts that were treated with strong plant derived poisons intended to stun prey. 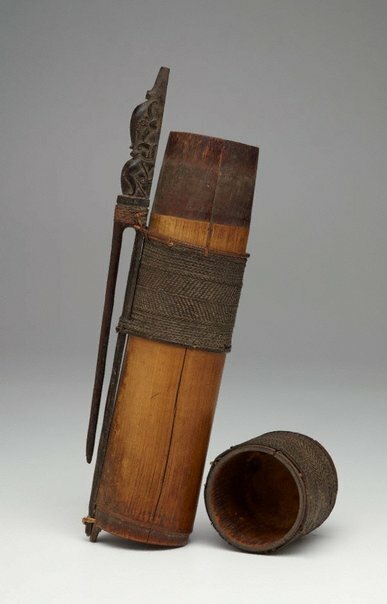 A long clip carved from wood and fastened to the bamboo tube with plaited rattan would have been used to attach the quiver to the hunter’s loincloth or belt. Hunting, like many utilitarian activities on Borneo, was associated with physical and spiritual perils. Symbolic imagery in the form of guardian dragon–dog (‘aso’) motifs, depicted on the clip of this quiver, would have provided protection to the hunter against misfortune and malevolent nature spirits. Christopher Wilson, pre Nov 1986-1996, Sydney/New South Wales/Australia, probably purchased in Sarawak, Malaysia mid 1970s or 1985. Appears in 'Southeast Asian tribal art', an unpublished text by Christopher Wilson, College of Fine Arts, Sydney, November 1986. Ancestral art of the Indonesian archipelago , Sydney, 2017, 51 (colour illus.). Southeast Asian Tribal Art , Nov 1986, Plate 11 (colour illus.) unpaginated..